South Dakota owns more than it owes. South Dakota is a Sunshine State with enough assets to cover its debt. Elected officials have created a Taxpayer Surplus™, which is each taxpayer's share of money available after state bills have been paid. TIA's Taxpayer Surplus™ measurement incorporates both assets and liabilities, not just pension debt. South Dakota has $3.2 billion of assets available to pay the state's bills totaling $2.3 billion. 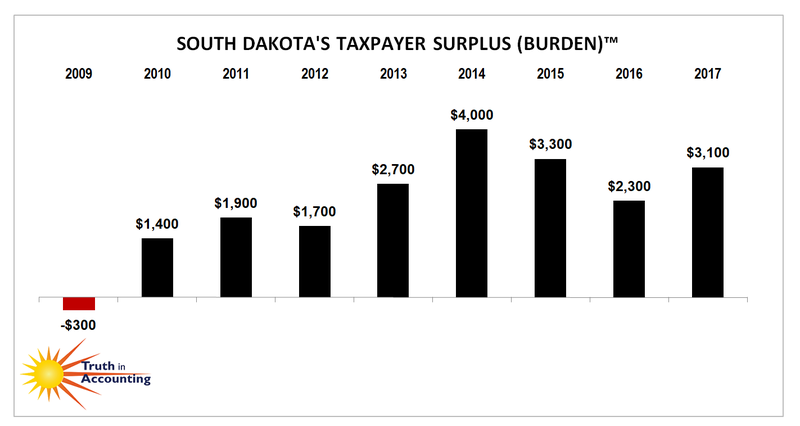 South Dakota has $922.7 million available after bills have been paid, which breaks down to $3,100 per taxpayer. 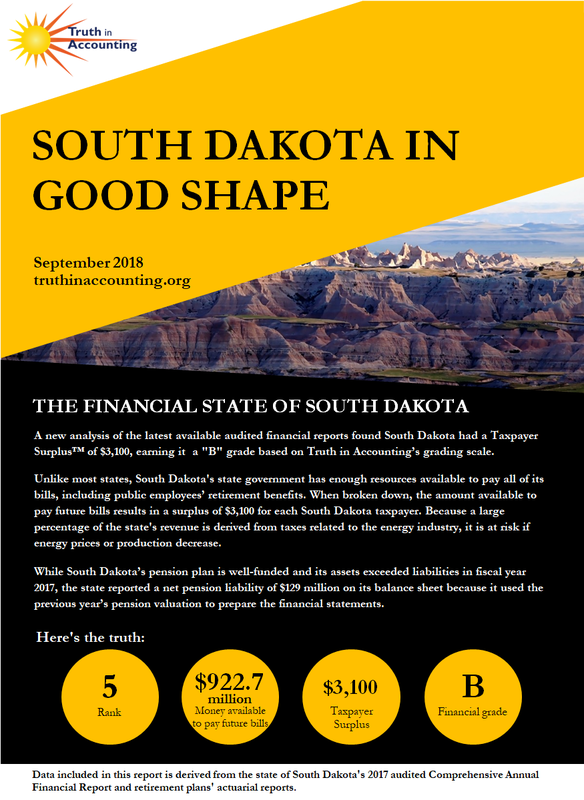 South Dakota's reported net position is inflated by $327.4 million, largely because the state defers recognizing losses incurred when the net pension liability increases. 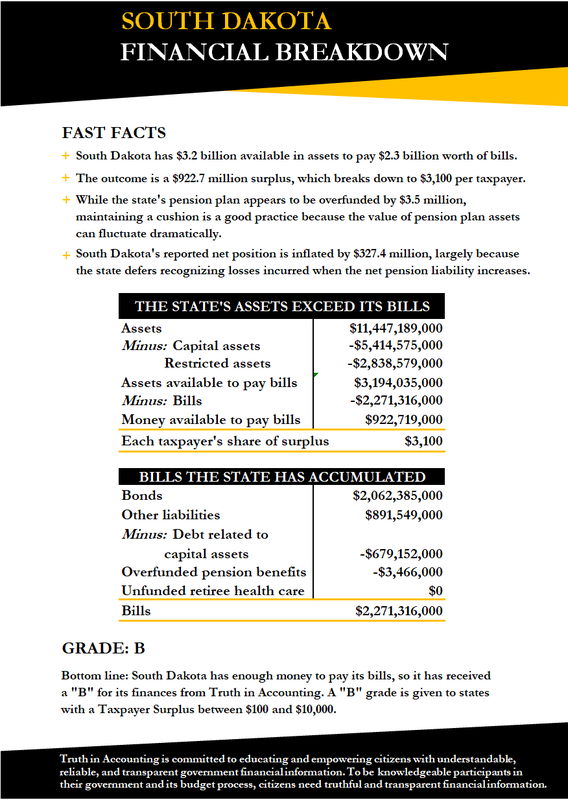 While South Dakota’s pension plan is well-funded and its assets exceeded liabilities in fiscal year 2017, the state reported a net pension liability of $129 million on its balance sheet because it used the previous year’s pension valuation to prepare the financial statements. The state's financial report was released 182 days after its fiscal year end, which is considered untimely according to the 180 day standard.